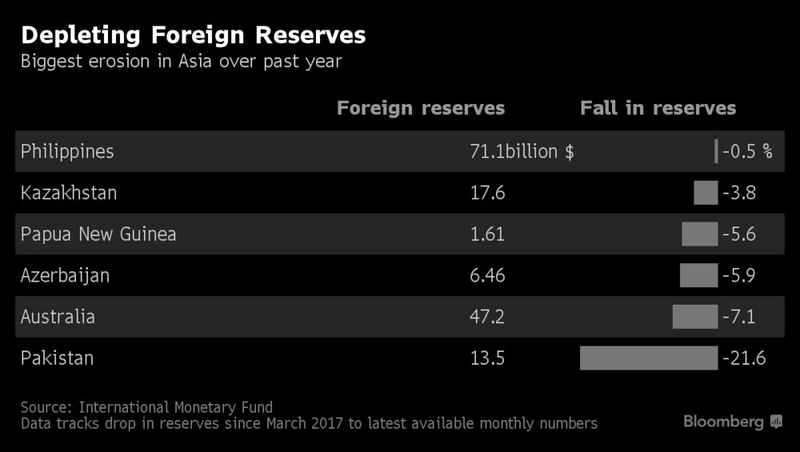 Pakistan is depleting its dollar reserves at the fastest pace in Asia and may soon have a buffer that’s smaller than Cambodia, an economy that’s less than a 10th of its size. 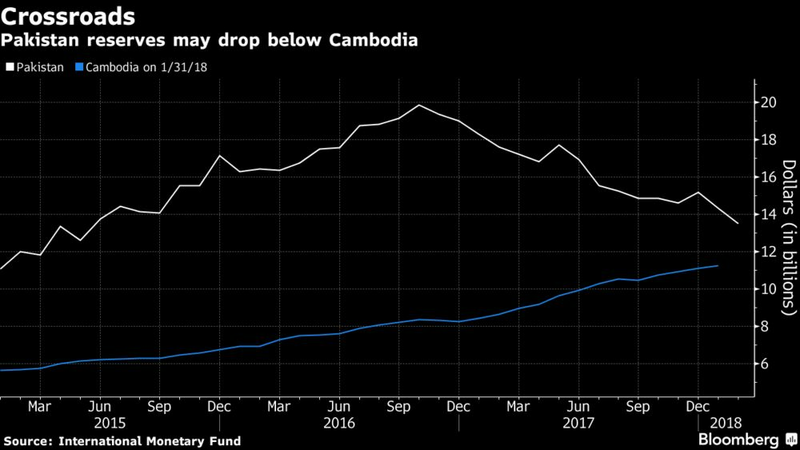 Reserves have dropped by about a fifth in the past year to reach $13.5 billion in February, while in Cambodia they’ve increased a third to $11.2 billion in January, according to data from the International Monetary Fund. Pakistan’s reserves are expected to drop as much as $2.2 billion by June, according to Insight Securities Pvt. Pakistan is facing a balance of payments crunch. Its current-account deficit has ballooned by 50 percent in the past eight months to $10.8 billion, fueled by rising imports as the economy grows close to 5 percent and Chinese funders add new power plants. With reserves coming under pressure, authorities devalued the currency for the second time in four months last week. Once known as East Pakistan before being separated in 1971, Bangladesh’s reserves are now more than double those of Pakistan’s, with exports that exceed its South Asian counterpart. Both nations as well as Cambodia are competitors in global textile markets. New Zealand and Kazakhstan are among other Asia Pacific countries with smaller economies but more reserves than Pakistan, according to data compiled by Bloomberg. There’s no respite seen for Pakistan’s reserves with authorities deciding not to sell global bonds this month because of rising global interest rates. Zubair Ghulam Hussain, chief executive officer at Insight Securities, is forecasting a decline in reserves even after factoring in $2.5 billion in borrowing and excluding inflows from a planned tax amnesty that’s scheduled to be announced this month. “There is no easy fix,” said Uzair Younus, a South Asia director at Washington-based consultancy Albright Stonebridge Group LLC. “The solution lies in improving the business climate” to attract greater foreign direct investment inflows and implementing reforms to make exports more competitive globally, he said. Previous articleBollywood movies often normalise sexual harassment against women as normal or even fun. But why?